Hutchinsons Enhanced Light Interception Orchard System (HELIOS) is a ground breaking 10 year project that that consists of two trial orchards that were planted this spring, one on East Kent, and the other in Herefordshire. The project sets out to explore the question of how orchard design can be improved to capture more sunlight, and thereby increase yield, but balanced against establishment costs, and also mindful of likely future developments in mechanisation such as robotic picking and mechanical pruning. The project leads on from work done in New Zealand by Stuart Tustin, who is based at ‘Plant and Food Research’ in Hawkes Bay. 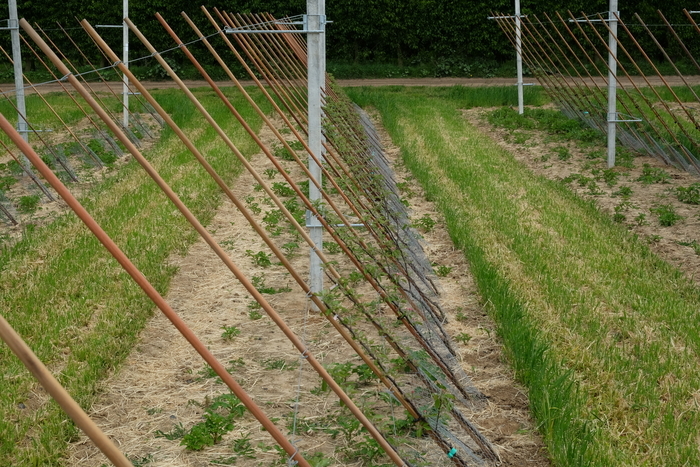 Stuart proposes that yield potential is ultimately a function of light utilisation, and that current orchard systems will always fall short of their theoretical maximum yields as they significantly fail to intercept a proportion of the available sunlight. HELIOS seeks to evaluate his theoretical work in practice, and under UK conditions. Growers will have opportunities to view the trial sites and learn about the development of each of the systems in the years to come; watch out for your invitation, or speak to your Hutchinsons agronomist about arranging a visit to HELIOS (in Greek mythology, the god of the sun).